Cluster Connections - Modify cluster settings or remove the cluster from OpsCenter. 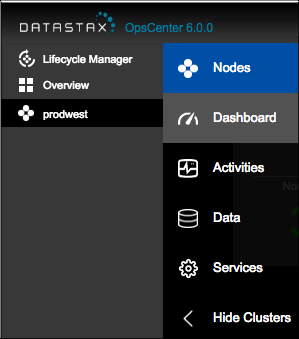 Help Center - opens the current DataStax OpsCenter documentation. Username - If authentication is enabled, the username for the currently logged in user is displayed. Click your username to change your password or to log out of OpsCenter. Services - Enable DataStax Enterprise Management Services; including the Backup, Repair, Capacity, Best Practice, and Performance services.